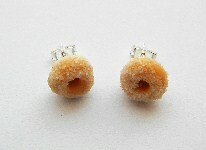 Miniature sugary doughnut stud earrings. Doughnuts are hand designed from polymer clay and are 8mm. Silver plated 5mm stud earrings with a butterfly backing.